The somewhat redundantly named (at least when translated to English) centerpiece of the Musuem of the Second World War in Ukraine. This was image #3 taken on my Canon 400D (aka the Rebel XTi) overall, with some modifications. On the original photo, the sunset was off near the right of the photo. Using some Photoshop magic, I centered it behind the base of the statue. Since this was done quite a few years ago, I can't actually remember how I did it! Currently the 18th tallest statue in the world. For comparison, the Statue of Liberty is #42. 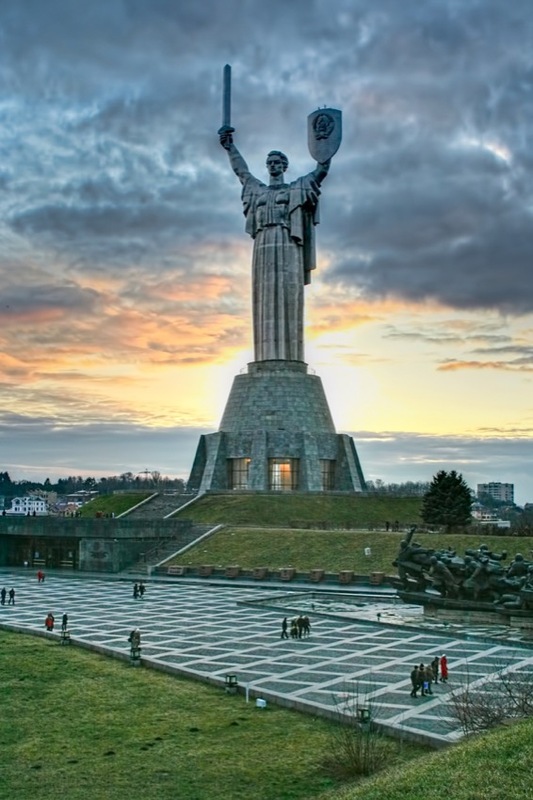 Held in the statue’s left hand is a shield with the State Emblem of the Soviet Union. For a small fee, you can go up to the height of the shield for a breathtaking view of the Kyiv skyline. Below the towering statue in its base is a Memorial hall that displays the names of 11,600 soldiers and over 200 workers on the home-front, honored during the war with the title of Hero of the Soviet Union.